Liam Harvey (aged 25), of Bristol Road, St Leonards, was found guilty of assault by beating. The offence took place at Hastings on July 14 last year. He was sent to prison for 20 weeks, suspended for 18 months. He was also given a community order with a requirement of 200 hours of unpaid work. He was ordered to pay £320 in compensation and £625 in prosecution costs. Magistrates said the reason for the sentence was because it was a road-rage, resulting in assault and injury. Theresa Feathers, (aged 58), of Little Twitten, Cooden, Bexhill, was found guilty of harassment by leaving letters on a car and posting them through a mailbox as well as shouting abuse, banging on windows and repeatedly ringing a doorbell at various times of day and night. Magistrates adjourned sentencing to allow for reports to be drawn up and made an exclusion order preventing her from contacting the victim or from entering Belle Hill, in Bexhill. John Tracy (aged 58), of Chain Lane, Battle, pleaded guilty to two charges of speeding while driving a heavy goods vehicle. The offences took place at Falmer Road, Woodingdean, Brighton, on February 22, last year and at Woolwich on April 19 last year. He was fined a total of £220 and his driving record endorsed with six penalty points. Tyler Battle, 24, of Sorrel Drive, Eastbourne, pleaded guilty to driving a Toyota Celica on Cooden Drive, Bexhill, on January 1 while over the drink-drive limit. He gave a breath alcohol reading of 54 microgrammes. The legal limit is 35mg. He also pleaded guilty to driving with no licence or insurance. He was fined £200 and banned from driving for 14 months. Jane Chapman, 27, of Chain Lane, Battle, pleaded guilty to stealing a pushchair and changing bag, worth £745, from Mothercare at Eastbourne on November 22. She was given an 18- month conditional discharge and ordered to pay £370 compensation. Liam Maclean (aged 20), of Harrow Lane, St Leonards, pleaded guilty to driving a vehicle on Belmont Road, Hastings, on January 1 while more than twice over the drink drive limit. He gave a breath alcohol reading of 86 microgrammes. The legal limit is 35mg. He was fined £250 and banned from driving for 20 months. James McGuigan (aged 29), of Bulverhythe Road, St Leonards, pleaded guilty to driving a vehicle on Brittany Road, St Leonards, on January 1 while more than twice over the drink drive limit. He gave a breath alcohol reading of 94 microgrammes. The legal limit is 35mg. 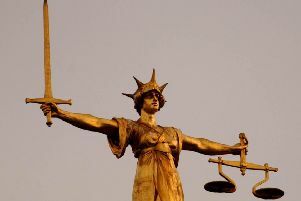 He also pleaded guilty to driving without insurance or a licence. He was fined £200 and banned from driving for two years. The court also made a community order with a requirement of 150 hours of unpaid work. Natasha McKimmie (aged 27), of Saxonwood, Battle, pleaded guilty to failing to provide a specimen of breath for analysis when required to do so by police. The offence took place at Hastings on December 25. She was fined £222 and banned from driving for one year. Mark Page (aged 51), of Mount Pleasant Road, Hastings, pleaded guilty to stealing a Sopranos box set, worth £49.99, from HMV at Hastings on November 1. He was given a one year conditional discharge. Jacob Shone-Porter (aged 22), of Palmarsh Avenue, Hythe, Kent, pleaded guilty to driving an Audi TT vehicle on Main Street, Beckley, on August 25 last year with cannabis in his blood stream. He was fined £66 and banned from driving for one year. He also pleaded guilty to speeding in Beckley, on the same date and to being in possession of a quantity of cannabis at Hastings on November 13 last year. He was fined £100 for the offences. Steven Thomas (aged 45), of Chitcombe Road, Broad Oak, Brede, pleaded guilty to driving a Mercedes car, on John Macadam Way, Hastings, on December 29, while nearly four times over the drink drive limit. He gave a breath alcohol reading of 131 microgrammes. The legal limit is 35mg. The court made a community order with a requirement of 180 hours of unpaid work and banned him from driving for 30 months. Colin Weskin (aged 44), of Battle Road, St Leonards, pleaded guilty to stealing a joint of beef, from Co-op, in Battle Road, on December 31. He also pleaded guilty to stealing washing powder products, worthy £44.10, from Tesco, in St Leonards on November 27. He admitted being in breach of a one year conditional discharge, imposed by Brighton Magistrates on November 3 for four offences of theft. He was fined a total of £75 and ordered to pay £44.10 in compensation. Kim White (aged 26), of London Road, St Leonards, pleaded guilty to being drunk and disorderly in a public place. The offence took place at Yates’ in Hastings on December 17. He also admitted being in breach of a conditional discharge, made by magistrates on October 10, for an offence of criminal damage. He was fined £380.